An Oakland Athletics player became the first Major League Baseball player to kneel during the anthem, while protests continued elsewhere. 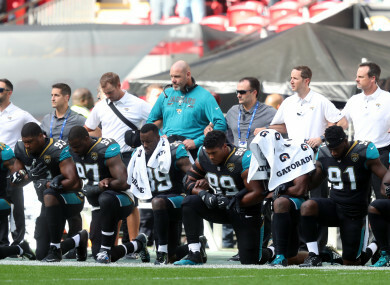 Jacksonville Jaguars players kneel in protest during the national anthem before the NFL International Series match at Wembley Stadium. THE ROW BETWEEN Donald Trump and sports stars in America continues to rage on, as more figures come out to stand against him. Following in the footsteps of Colin Kaepernick, Bruce Maxwell of the Oakland Athletics elected to kneel during the National Anthem over the weekend, making him the the first Major League Baseball player to do so. Similar scenes unfolded in Wembley Stadium this afternoon, with some players from the Jacksonville Jaguars and Baltimore Ravens choosing to kneel during the anthem at the NFL International Series match. “We’re not participating in the anthem today,” he told CBS, “not to be disrespectful to the anthem (but) to remove ourselves from the circumstance. “People shouldn’t have to choose. If a guy wants to go about his normal business and participate in the anthem, he shouldn’t be forced to choose sides. “He shouldn’t be separated from his teammates who chooses not to. We’re not participating today, that’s our decision. Meanwhile, Jed York, the CEO of Kaepernick’s former side the San Francisco 49ers, has also spoken publicly against Trump. Trump got involved in quite a public dispute with some of America’s most respected athletes over the weekend. He published a tweet on his official account claiming to have withdrawn an invitation for the Golden State Warriors to come and visit him in the White House. He made the statement in response to Steph Curry’s remarks, in which he said he didn’t want to attend the traditional visit to the President. Curry told ESPN that the team have ‘an opportunity to send a statement’ by declining to go to the White House. Email “Row with Donald Trump rages on as more sports stars unite against him”. Feedback on “Row with Donald Trump rages on as more sports stars unite against him”.